The minimalist lines of the wine cellar open onto large glass windows that highlight the best Italian and foreign labels. The aim of our cellar is to preserve the art of wine’s precious features, though continuous monitoring of temperature and humidity. Our professional staff will provide assistance in choosing the wine that better suits your taste from our extensive wine list or will recommend special and unique combinations to create surprising contrasts and alchemies. A complete selection of over 200 exclusive labels including the Champagne collection- from Dom Perignon to Ruinart, from Laurent Perrier to Moet Chandon and the prestigious Krug – and the ever-present selection of Proseccos and wines produced in the Classical Method. The list of white wines is a journey along the Bel Paese, from Valle d’Aosta to the lands of Sicily. Chardonnay grapes, Ribolla, Malvasia, Vermentino, Turbiana, Sauvignon, Vermentino or Insolia offer the aromas and the flavors of Italy in a glass. Likewise, our range of red wines, full-bodied and opulent, covers every region from the north to the south of Italy. Sangiovese and Barbera, two of the most popular Italian grape varieties, are definitely the star attractions, right alongside less popular wines such as Teroldego, Nebbiolo, Cabernet, Nero d’Avola and Syrah. A selection of rosé and dessert wines like Recioto della Valpolicella or Picolit provide the perfect end to any meal. 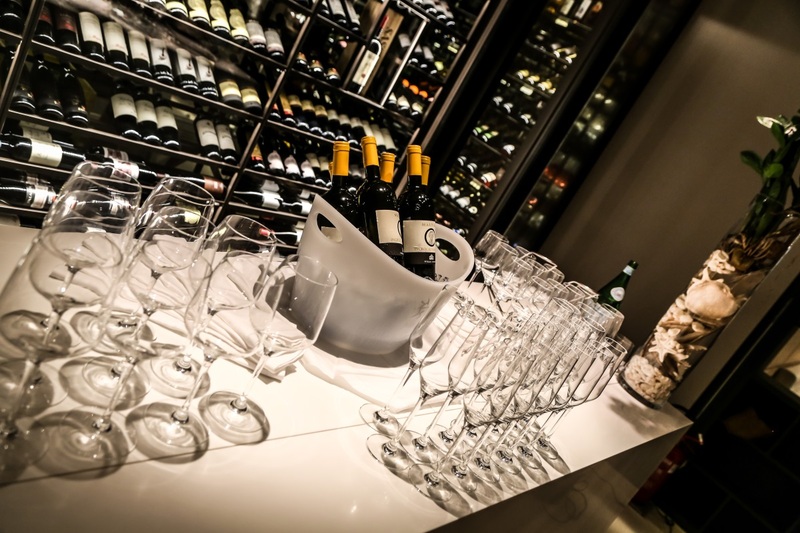 Spectacular and sophisticated, the wine cellar is the perfect setting for private events and conferences, the ideal location for wine tasting or workshops dedicated to the prestigious art of wine. Entering the cellar to choose a bottle and sampling wines in the corner overlooking the labels provides our guests with a truly unique experience. The staff at Mediterra will also be happy to assist you in planning dedicated wine tasting events and enjoyable samplings.